No. 30 & 32, Jalan 2/16, Taman Universiti Indah, 43300 Seri Kembangan, Selangor, Malaysia. TRANSYNERGY TECHNOLOGY SDN BHD (formerly knows as Transynergy Technology Services & Engineering) was incorporated in Malaysia since 2001 and had been serving customers in a wide range of industries. 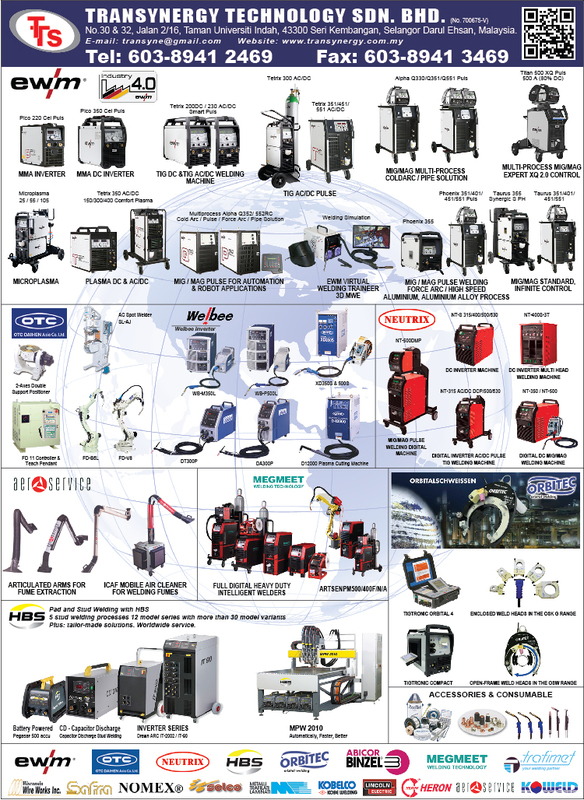 We are specialist provider of digital welding machine. We hold the exclusive sole distributors & agency for few renowned brands of welding products from oversea country. We aspire to be one; seamless company focused on offering a wide range of welding products and services. Customer demands are over changing and relentless in terms of scope and number. We will be equally relentless in deploying our strategy throughout Transynergy Technology and staying ahead of the curve. We may be young but have proven that we can complete with the best and successfully carve out our own highly profitable niche in a very tough business. We stand eager to work jointly and creatively with you to support your business and the bottom line. Our products and value-added services flow directly to your needs and expectations. You can expect consistency in the excellence of our products and services. Our core business and activities are providing trading, servicing and repairing of welding equipment machinery and engineering works.